We’re three weeks into #MMMay17, I’ve pledged to wear something I’ve made every day. The problem I’ve had isn’t finding something to wear, it’s finding someone to take a photograph! So some of the photos are from when I made it, but I did wear it, honest!! 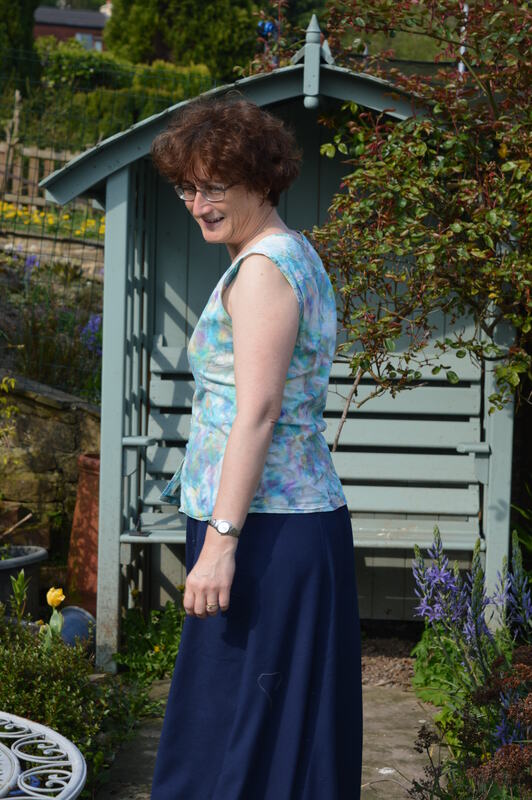 This sleeveless top from a couple of years ago works well with my navy straight skirt. 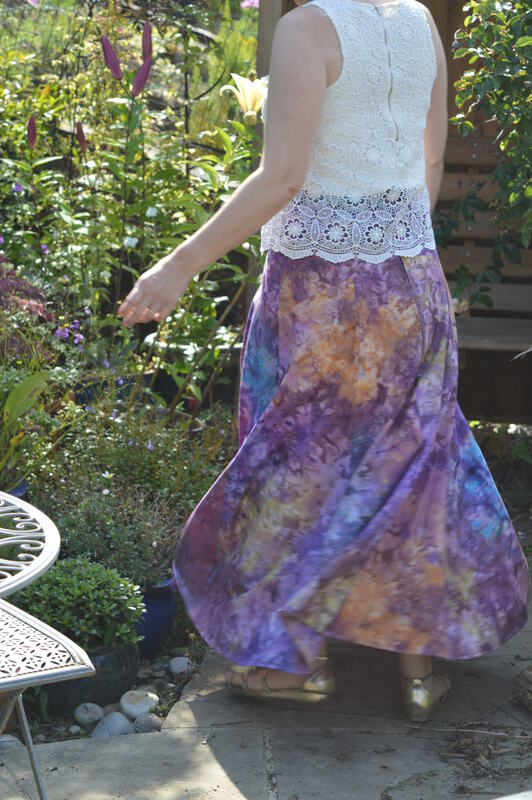 This was the second Gabriola skirt I made, I’m still not sure about the colours in the tie-dye, but I wear it quite a lot as an everyday skirt. Another tie-dye, this time it’s a lovely soft cotton which makes the top really nice to wear. The skirt this time was my navy Fumeterre skirt, I still really like this pattern. I wore my sewing Archer’s shirt to Otley show. 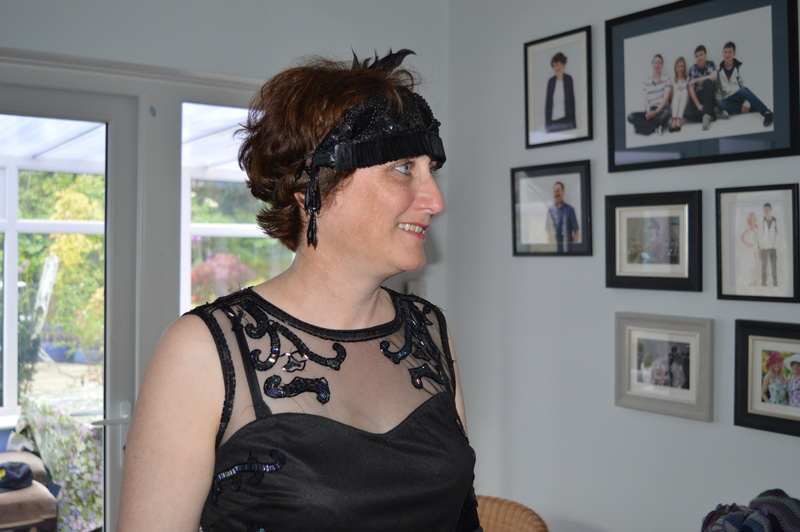 …and the more I look at it, the more I’m convinced it’s the genuine article, as in a 1920’s headdress. It’s beautiful, all beads, sequins and velvet. We have a lady at Embroiderers Guild who is a bit of an expert on costume and textiles, so I’m thinking of taking it to show her. I needed some way of attaching it to my head and I decided Kate Chiconi’s suggestion of a short length of elastic was probably the safest, in that I could see if I was constantly adjusting hair grips, I would damage the ends. I was still concerned about the pressure put on by stitching elastic on, I remembered seeing some black powermesh, left over from when I made a bra. I gently tacked it onto the back and then stitched the elastic to the powerflex. It seemed to work as it was all in one piece when I got home. Which is more than could be said for my feathers, I hadn’t even reached the venue when I realised they had flown off somewhere! I did have to laugh as a lot of ladies wore black feather boas and the floor looked like a few birds had come to sticky ends as there were feathers everywhere! 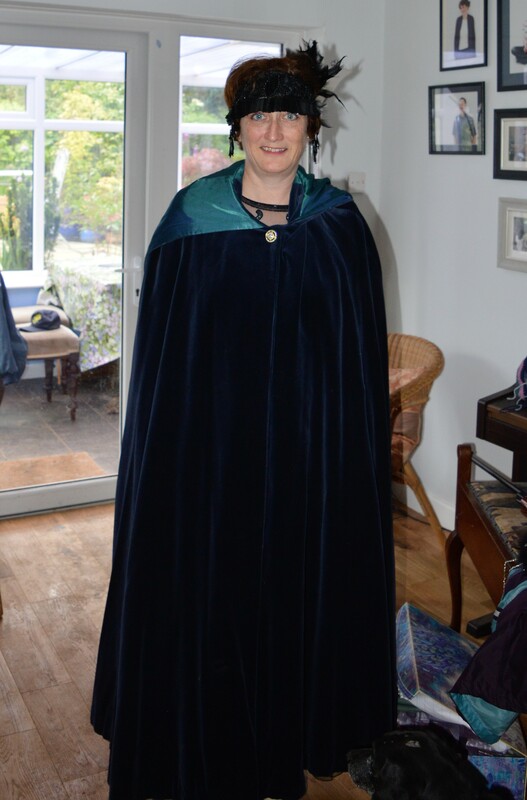 To complete the outfit I wore my midnight blue velvet cape. I made this nearly 30 years ago and I still remember the traumas I had trying to stitch a satin lining onto velvet!!! It’s locally known as my Scottish Widows cape after the lady in an advert many years ago. 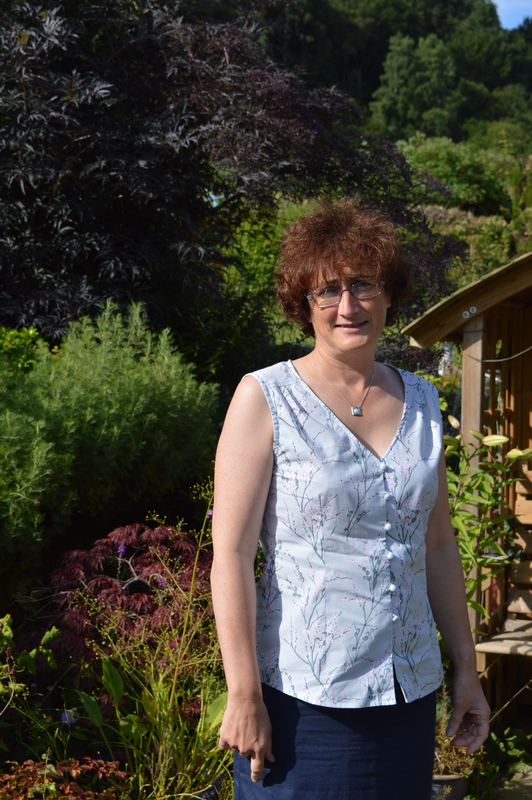 This entry was posted in Dressmaking, Serendipity and tagged #MMMay17. Bookmark the permalink. oh well done! so many lovely clothes you’ve made! Love the dress and headdress. You look so 1920s! The headdress looks interesting, what is the fringe part made from? Are they some kind of sequin? Thanks Maggie, the fringe is made up of like long, flat heavy weight sequins. A veritable fount of useless knowledge! Fantastic 20’s look, and the cape is perfect! Love the headress – and love the idea of Me Made May – I only just read about this a week or so ago. You never know, next year I might join in – no promises as I tend to make little crafty things, but never say never! Well done with the other outfits too. Thank you, thank you, thank you. You look amazing in the flapper costume. I think you should wear it regulalry from now on. Be interesting to find out more about the head dress. I love the idea of wearing something you’ve made everyday – and you are clearly very talented! I love your black beaded dress and cape. I hope you had fun! 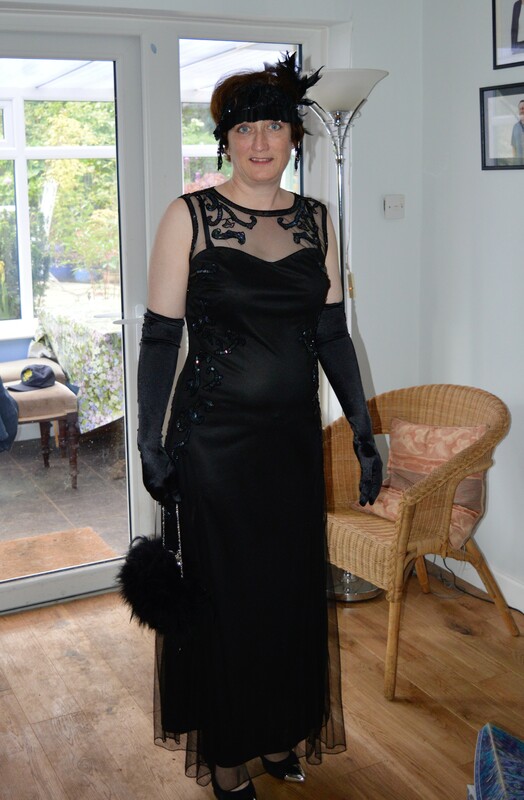 Very 20’s , too bad about the birds on the floor! Guess they just don’t make boas like they used too!😉 Your Me Made May is turning out quite nicely.